Today in American Civil War History the 54th Regiment of Massachusetts Infantry, a regiment of free blacks assaulted Battery Wagner. Battery Wagner was situated on a small island that guarded the approaches from the sea-side of Charleston SC. The regiment was the lead regiment in Strong’s Brigade and thus would take the bulk of the casualties. The assault was frontal made because of a marshy creek on one side and the sea on the other. The approach was narrow and only one regiment at a time could fit in the space. The garrison of the fort was formidable consisting of Confederate Infantry from South Carolina, North Carolina and Georgia. Infantry strength was around 1000 muskets. As if that was not bad enough the Confederates garrisoned the fort with numerous cannon, some of very high-caliber and deployed to cover the landward approach on Morris Island (most of which is under water today). A further battery of four 12lb howitzers covered the ground the assault would have to be made over. 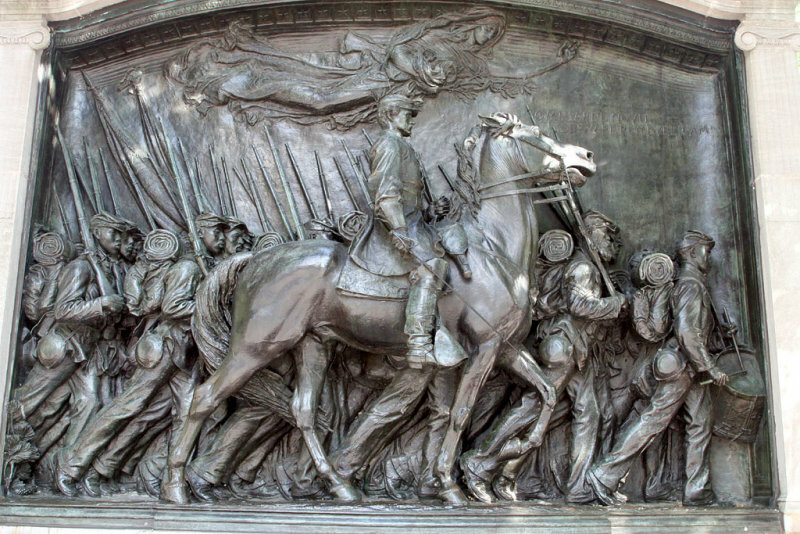 The 54th Massachusetts was an “experimental unit.” What this meant is that the white establishment of the north (for the most part) didn’t believe that “colored” soldiers of any race possessed the fighting qualities of white soldiers. This was the prevailing view even though many West Point trained army officers were well aware of the colonial soldiers of England and France and their fine fighting reputations. The 54th had to overcome prejudice from their own side as well as living under the threat of execution by Confederate forces should they be captured. The threat of execution also applied to the white officers that led the 54th. Ironically, as manpower became a huge issue in the Confederacy the Confederate Congress authorized the establishment of black regiments in the Confederate Army although few were raised. There are surviving pictures of Black Confederate soldiers however. The 54th went to war with the expectation that they would only be used as a labor battalion. It took political pressure from the Colonel of 54th, Robert Gould Shaw, whose family were powerful Boston aristocrats to get the 54th into action. Eventually, the 54th was sent to assist the Union Army engaged in coastal operations along the South Carolina Coast. It was the intent of the Union Navy to seal off all the coastal Confederate ports with a blockade to prevent the Confederates from obtaining supply and armaments from Europe but primarily from Great Britain. The Union Army assigned to SC was part of the Navy’s larger ambitions to close the ports and Battery Wagner stood in the way. 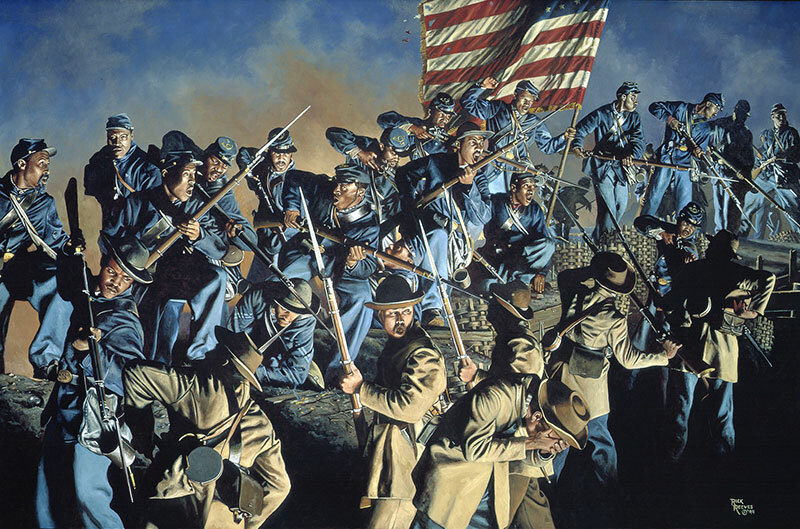 The 54th made the assault on July 18th, 1863. They lost about 50% of their strength including Colonel Shaw and many of the white officers. The white regiments also suffered severely in the operation and after. The fort never fell and was abandoned later in the war as Charleston became outflanked on the landward side. The 54th example was a success in the sense that it proved to skeptical white officers that black soldiers were every bit as competent and brave as white soldiers. Shortly after the assault the North officially enrolled black soldiers (many liberated slaves) into the army. They were designated US Colored Troops and uniformed like any other US Regular Infantry. About 180,000 would eventually serve the Union cause. Sadly, US Colored troops were only paid $10.00 a month (for a pvt) as opposed to the $13.00 a month white soldiers received thus reflecting the continued prejudice against black soldiers. The movie “Glory” starring Matthew Broderick (as Shaw), Denzel Washington and Morgan Freeman tells the story well of the 54th Massachusetts. I watched in last night. Below is a brief documentary from Discerning History that tells the story of the 54th role in the assault. “….the Confederate Congress authorized the establishment of black regiments in the Confederate Army…” Yes, the Confederate Congress did but only in the closing months of the war when it was extremely desperate. This was a government which held it had the right to execute captured black Union troops and their white officers.